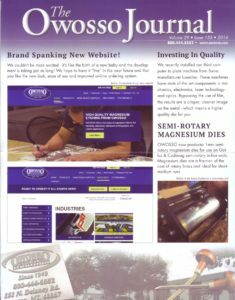 1st Edition 2016 - OWOSSO Graphic Arts, Inc. Featured: Brand Spanking New Website! We couldn’t be more excited – it’s like the birth of a new baby and the development is taking just as long! We hope to have it “live” in the near future and that you like the new look, ease of use and improved on-line ordering system.